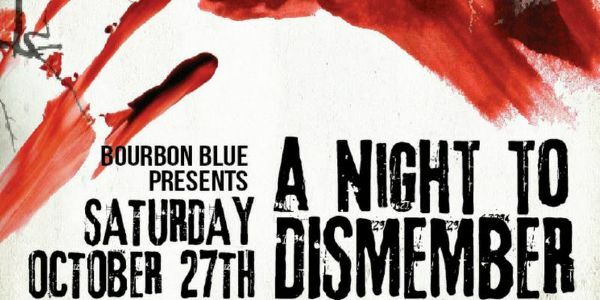 Come out this Halloween for A NIGHT TO DISMEMBER at Bourbon Blue! This great venue, with a New Orleans vibe, will make you feel like you're right on a haunted version of Bourbon Street! Whether you're in the Canal Lounge or groovin' to the DJ in the floor below, you'll be surrounded by sulty satans and hunky heroes! DJ playing all your favorite, festive jams! NOTE: Tickets for open bar will NOT be available at the door. Prices will increase as we get closer to the event and will be more at the door. So, for guaranteed entry and to save $$, absolutely purchase your tickets ASAP before the price goes up or the event sells out! Costume contest categories with prizes for: Best Costume $250 Prize, Best Couple or Group Costume $150, Most Creative Costume $100. Dress to impress to win! The DJ will select a winner based on crowd noise at 12am, tell your friends to cheers for you!